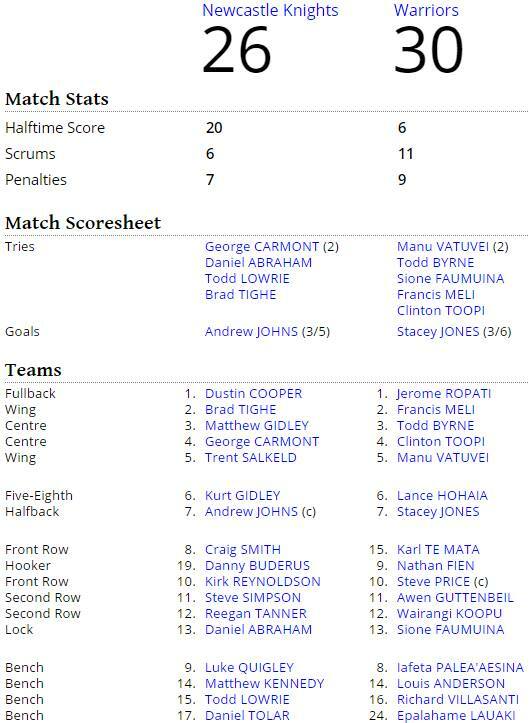 This Flashback Friday we rewind the clock back to 17 April 2005, where at Australia Energy Stadium (now known as Hunter Stadium) we were down 20 to nil after 39 minutes. Right on halftime the Warriors score taking the score to 20-6. The 2nd half would see the Warriors claw back the score and eventually win the game 26-30. Part of what started the fightback was when Andrew Johns, of 9th Immortal pinger popping fame, collided with Jerome Ropati and broke his jaw. Up until then he was putting on a masterclass. Also going in the Warriors favour was Knights lock Daniel Abraham going off with a broken leg. To date the 20 point deficit is still the Warriors biggest ever comeback.